Lawrence Baum. Specializing the courts. The University of Chicago Press, 2011. This book provides an analysis of the growing trend toward specialization in the federal and state court systems. 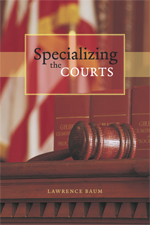 The author examines the process by which court systems in the United States have become increasingly specialized and the motives that have led to the growth of specialization as well as the effects of judicial specialization on the work of the courts by demonstrating that under certain conditions, specialization can and does have fundamental effects on the policies that courts make. Christian Henderson. 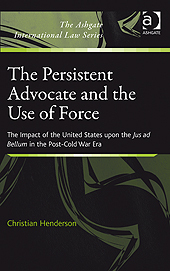 The persistent advocate and the use of force : the impact of the United States upon the jus ad bellum in the post-Cold War era. Ashgate Pub., c2010. This book provides an empirical analysis and assessment of the discernible impact that the US has had upon the jus ad bellum in the post-Cold War era. The work focuses on the substantive areas of the jus ad bellum with which the US has most often and significantly engaged with through either its actions, justifications for actions, or adopted policies. In doing so, it draws upon the theory of interpretive communities as its framework of analysis in order to gauge any impact upon this fundamental area of international law. Bruce Dravis. The role of independent directors in corporate governance : an update of the Role of independent directors after Sarbanes-Oxley. American Bar Association, c2010. Lee Harris. Mastering corporations and other business entities. Carolina Academic Press, c2009. N.W. Barber. The constitutional state. Oxford University Press, 2010. Rebecca P. Butler. Smart copyright compliance for schools : a how-to-do-it manual. Neal-Schuman Publishers, c2009. Lee Wilson. Fair use, free use, and use by permission : how to handle copyrights in all media. Allworth Press, c2005. Mark D. Cunningham. Evaluation for capital sentencing. Oxford University Press, 2010. Texas death row : reflections of a different world / edited by Jennifer Gauntt, et al. Texas Review Press, 2010. Janet Leach Richards. Mastering family law. Carolina Academic Press, c2009. Charles P. Kindregan, Jr., Maureen McBrien. Assisted reproductive technology : a lawyer's guide to emerging law and science. 2nd ed. American Bar Association, Section of Family Law, c2011. Guofu Liu. Chinese immigration law. Ashgate, c2011. Protecting the displaced : deepening the responsibility to protect / edited by Sara E. Davies, Luke Glanville. Martinus Nijhoff Publishers, 2010. David A. Gauntlett. IP attorney's handbook for insurance coverage in intellectual property disputes. American Bar Association, c2010. Intellectual property rights in a fair world trade system : proposals for reform of TRIPS / edited by Annette Kur, Marianne Levin. Edward Elgar, c2011. George W. Kuney, Donna C. Looper. Mastering intellectual property. Carolina Academic Press, c2009. Diana Panke. The effectiveness of the European Court of Justice : why reluctant states comply. Manchester University Press, 2010. Matthew Collins. The law of defamation and the Internet. 3rd ed. Oxford University Press, 2010. Thomas J. Bernard, Megan C. Kurlychek. The cycle of juvenile justice. 2nd. ed. Oxford University Press, 2010. Richard A. Posner. Economic analysis of law. 8th ed. Aspen Publishers, c2011. Bruno Nascimbene, Elisabetta Bergamini. The legal profession in the European Union. Wolters Kluwer, c2009. Aspen Publishers, c2011. International pre-nuptial and post-nuptial agreements / edited by David Salter, et al. Family Law, c2011. Norman A. Martinez Gutierrez. Limitation of liability in international maritime conventions : the relationship between global limitation conventions and particular liability regimes. Routledge, 2011. Richard F. Cauley. Winning the patent damages case : a litigator's guide to economic models and other damage strategies. Oxford University Press, c2009. Jennifer L. Dzwonczyk. The patent litigator's job : a survival guide. American Bar Association, c2010. Patents, technology, and commerce / edited by Christine L. Jansen, Derek A. Hyman. Nova Science Publishers, c2009. Christopher H. Pyle, Richard M. Pious. The Constitution under siege : Presidential power versus the Rule of Law. Carolina Academic Press, c2010. Equal play : Title IX and social change / edited by Nancy Hogshead-Makar, Andrew Zimbalist. Temple University Press, 2007. William D. Bader, Frank J. Williams. Unknown justices of the United States Supreme Court. William S. Hein & Co., Inc., 2011. Janice C. May. The Texas State Constitution. Oxford University Press, USA, 2011. Water Resources Planning and Management / edited by R. Quentin Grafton, Karen Hussey. Cambridge University Press, c2011. Michelle L. Meloy, Susan L. Miller. The victimization of women : law, policies, and politics. Oxford University Press, 2011. Protecting the American dream. Pt. 1 : a look at the Fair Housing Act : hearing before the Subcommittee on the Constitution, Civil Rights, and Civil Liberties of the Committee on the Judiciary, House of Representatives, One Hundred Eleventh Congress, second session, March 11, 2010. Protecting the American dream. Pt. II : combating predatory lending under the Fair Housing Act : hearing before the Subcommittee on the Constitution, Civil Rights, and Civil Liberties of the Committee on the Judiciary, House of Representatives, One Hundred Eleventh Congress, second session, April 29, 2010. Google and Internet control in China : a nexus between human rights and trade? : hearing before the Congressional-Executive Commission on China, One Hundred Eleventh Congress, second session, March 24, 2010. Census in peril: getting the 2010 decennial back on track-parts I and II hearings before the Committee on Homeland Security and Governmental Affairs, United States Senate, One Hundred Tenth Congress, second session, March 5 and April 15, 2008. Home foreclosures : will voluntary mortgage modification help families save their homes? Pt. II : hearing before the Subcommittee on Commercial and Administrative Law of the Committee on the Judiciary, House of Representatives, One Hundred Eleventh Congress, first session, December 11, 2009. To consider possible impeachment of United States District Judge G. Thomas Porteous, Jr. Pt. II : hearing before the Task Force on Judicial Impeachment of the Committee on the Judiciary, House of Representatives, One Hundred Eleventh Congress, first session, December 8, 2009. Keeping foreign corruption out of the United States : four case histories : hearing before the Permanent Subcommittee on Investigations of the Committee on Homeland Security and Governmental Affairs, United States Senate, One Hundred Eleventh Congress, second session, February 4, 2010. Asian carp : hearing before the Subcommittee on Water and Power of the Committee on Energy and Natural Resources, United States Senate, One Hundred Eleventh Congress, second session, to examine the science and policy behind the federal framework and nonfederal efforts to prevent introduction of the aquatic invasive Asian carp into the Great Lakes, February 25, 2010. Organ Mountains-Desert Peaks Wilderness Act : hearing before the Committee on Energy and Natural Resources, United States Senate, One Hundred Eleventh Congress, second session, to receive testimony on S. 1689, Organ Mountains-Desert Peaks Wilderness Act, Las Cruces, NM, February 15, 2010. Legacies of war : unexploded ordnance in Laos : hearing before the Subcommittee on Asia, the Pacific, and the Global Environment of the Committee on Foreign Affairs, House of Representatives, One Hundred Eleventh Congress, second session, April 22, 2010. Thailand : the path toward reconciliation : hearing before the Subcommittee on Asia, the Pacific, and the Global Environment of the Committee on Foreign Affairs, House of Representatives, One Hundred Eleventh Congress, second session, June 10, 2010. Legal issues concerning state alcohol regulation : hearing before the Subcommittee on Courts and Competition Policy of the Committee on the Judiciary, House of Representatives, One Hundred Eleventh Congress, second session, March 18, 2010. Health care reform : an economic perspective : hearing before the Committee on Finance, United States Senate, One Hundred Tenth Congress, second session, November 19, 2008. Afghanistan : governance and the civilian strategy : hearing before the Committee on Foreign Relations, United States Senate, One Hundred Eleventh Congress, second session, July 14, 2010. Could bankruptcy reform help preserve small business jobs? : hearing before the Subcommittee on Administrative Oversight and the Courts of the Committee on the Judiciary, United States Senate, One Hundred Eleventh Congress, second session, March 17, 2010. Reviewing America's commitment to the refugee convention : the Refugee Protection Act of 2010 : hearing before the Committee on the Judiciary, United States Senate, One Hundred Eleventh Congress, second session, May 19, 2010. United States v. Stevens : the Supreme Court's decision invalidating the crush video statute : hearing before the Subcommittee on Crime, Terrorism, and Homeland Security of the Committee on the Judiciary, House of Representatives, One Hundred Eleventh Congress, second session, May 26, 2010. Legal liability issues surrounding the Gulf Coast oil disaster : hearing before the Committee on the Judiciary, House of Representatives, One Hundred Eleventh Congress, second session, May 27, 2010. Administrative Conference of the United States : hearing before the Subcommittee on Commercial and Administrative Law of the Committee on the Judiciary, House of Representatives, One Hundred Eleventh Congress, second session, May 20, 2010. Hearing on economic challenges facing middle class families : hearing before the Committee on Ways and Means, U.S. House of Representatives, One Hundred Tenth Congress, first session, January 31, 2007.